A renal cyst is a sac containing fluid that is within or attached to the kidney. 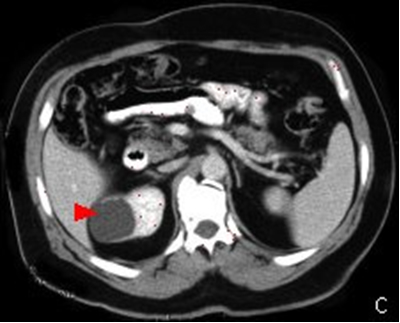 The great majority of renal cysts are not symptomatic or dangerous and are discovered incidentally on abdominal imaging studies (ultrasound, computerized tomography, or magnetic resonance imaging). Renal cysts are very common, occurring in about 25% of adults over 40 and 50% of adults over 50 years of age. They are quite variable in size, ranging from the size of a pea to the size of a large cantaloupe. Most renal cysts are what are referred to as simple cysts. These are spherical in shape, have a very thin wall, are filled with fluid, do not contain septa (divisions within the walls), calcifications, or solid components, and do not enhance (take up contrast) on imaging studies. Essentially, they have the appearance of water balloons, are benign, and simply need to be followed, as they will rarely evolve into a problematic situation. Although large cysts may become symptomatic by pressing on adjacent organs, this is rather unusual as most do not cause any symptoms. Only very rarely do cysts require treatment or intervention. 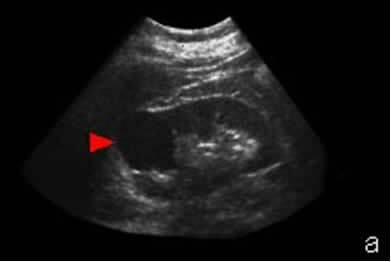 Ultrasound is a non-invasive technique for determining the number, location, and size of cysts and excellent means of following cysts. 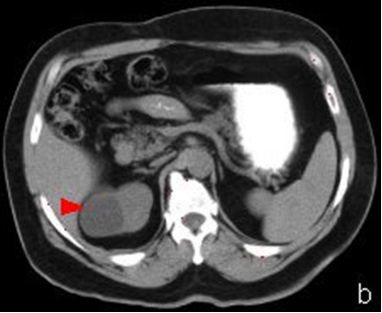 Although the vast majority of renal cysts are simple benign cysts, there are other cystic masses in the kidney that may be more complex, on occasion representing a cystic malignancy of the kidney. If a cyst has a thickened wall, septa, calcification, or enhances with contrast, it is not classified as a simple cyst, but as a complex cyst. I A benign simple cyst with a hairline thin wall, and no septa, calcifications, or solid components. It measures water density and does not enhance. II A benign cyst that may contain a few hairline septa in which "perceived" enhancement may be present. Fine calcification may be present in the wall or septa. This category includes high density cysts that are less than 3cm, are well marginated, and do not enhance. IIF (F for follow-up) Cysts that may contain multiple hairline thin septa or minimal smooth thickening of their wall or septa in which "perceived" enhancement may be present. Calcification may be thick or nodular, but no contrast enhancement is present, and these are generally well marginated. III "Indeterminate" cystic masses that have thickened irregular or smooth walls or septa in which enhancement is present. These need to be explored surgically, although some will prove to be benign including hemorrhagic cysts, chronic infected cysts, and multiloculated cystic nephroma, while some will be malignant including cystic renal cell carcinoma. IV These are clearly malignant cystic masses that have all the characteristics of category III, but also contain enhancing soft tissue components adjacent to the wall of the septum. These include cystic carcinomas and require surgical removal.